Kaycee lives in Sunshine, an old-fashioned and strictly religious town. Everyone goes to the football match on Friday and to church on Sunday. Kaycee's best friend dreams of a simple life for both of them together with their future husbands who are of course also friends. Kaycee tries to find a boy she likes, but dating has proven to be disastrous so far. She has to keep this up until she can go to college, her ticket out of the town. When Bren starts at Kaycee's high school she immediately makes a lot of new friends. Bren is easy to get along with. Even though Kaycee is scared of Bren she lets herself come closer, because she feels drawn to her. When she and Bren start seeing each other regularly Kaycee doesn't say anything to her mother or her best friend. Bren might have no problems being herself, but for Kaycee things are different as she knows there will be repercussions. When she threatens to lose everything she holds dear she doesn't have a choice any longer and she has to stand up for herself and everyone else in Sunshine who isn't allowed to be with the person they love. 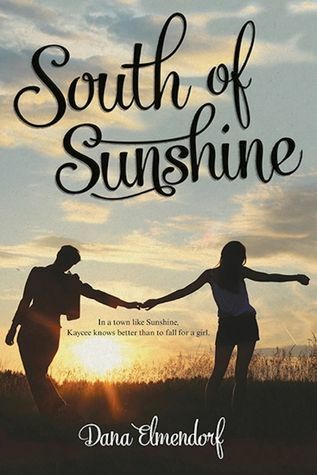 South of Sunshine is a beautiful story about a girl who's gay in a world where she can't openly be who she is. I felt bad for Kaycee because she has to hide such an important part of herself. Fortunately she has someone she can talk to, a friend who will always have her back. Their conversations are meaningful and interesting, but they also have a lot of fun together. Dana Elmendorf has a great way of writing about friendships. Everything in her story feels really natural, it has a laidback kind of charm which I liked very much. Kaycee and Bren are really sweet together and they have great chemistry. It was obvious from the beginning that they would be a wonderful couple. I love how Dana Elmendorf describes their connection. They aren't only in love, they are also good friends. Because it's so obvious what they feel for one another Kaycee can't hide their relationship forever and when it comes out things start to unravel. Dana Elmendorf keeps the events realistic, nothing is over the stop and everything stays completely believable. It's something I liked a lot, because it makes the story feel genuine. South of Sunshine is a quick and easy read with an important topic. It's a good combination as it means the reader can completely focus on the story. Dana Elmendorf has an important message to share and I love the theme of her book. Kaycee is a great and likable main character, so it was easy to care about what happened to her. South of Sunshine is an amazing moving story and I highly recommend it. I'm interested in finding out what it was like for Kaycee after her family and friends found out about her relationship. Hopefully they were happy for her. I'm glad Kaycee found Bren who she be herself with.